Ernest & Celestine Tote Bag Prize Pack Giveaway! Fine Print: I was given a copy of the movie for review and the film company is giving a prize pack to a reader. All opinions and statements below are my own. Have you heard of the film Ernest & Celestine? It was released on DVD and Blu-Ray a few months ago and it is a lovely story of two friends. Featuring the voice talents of celebrated actors including Forest Whitaker, Mackenzie Foy, Lauren Bacall, Paul Giamatti, William H. Macy, Megan Mullally, Nick Offerman and Jeffrey Wright, this film will leave you and your children smiling. Deep below snowy, cobblestone streets, tucked away in networks of winding tunnels, lives a tiny mouse named Celestine. Unlike her fellow mice, Celestine is an artist and a dreamer, and has a hard time fitting in. When she nearly ends up as breakfast for a grumpy bear named Ernest, the two become fast friends and embark on an adventure that will put a smile on your face and make your heart glow. 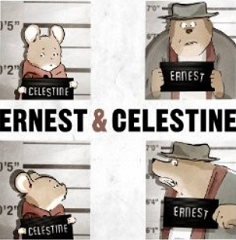 To get everyone excited about this movie, I am giving one lucky winner an Ernest & Celestine Tote Bag Prize Pack! To enter this giveaway, complete any or all of the options listed below. Giveaway ends 9/1. Good luck! William H. Macy is my favorite. Forest Whitaker is my favorite. My favorite is William H. Macy. Forest Whitaker is my favorite voice actor listed. Lauren Bacall would be my favorite voice actor. Forest Whitiker is the one I like. I love Lauren Bacall, may she rest in peace. William H. Macy is a favorite actor from the list so I would enjoy hearing his voice.